Seven dayyyyyssssss… until my last “first day of school” EVER. Woohoo! This back to school season isn’t met with as much whining since I chose classes that I’m genuinely curious about and hopefully it well be a fun time. Regardless, I’ve always loved back to school shopping and getting organized for the new year. 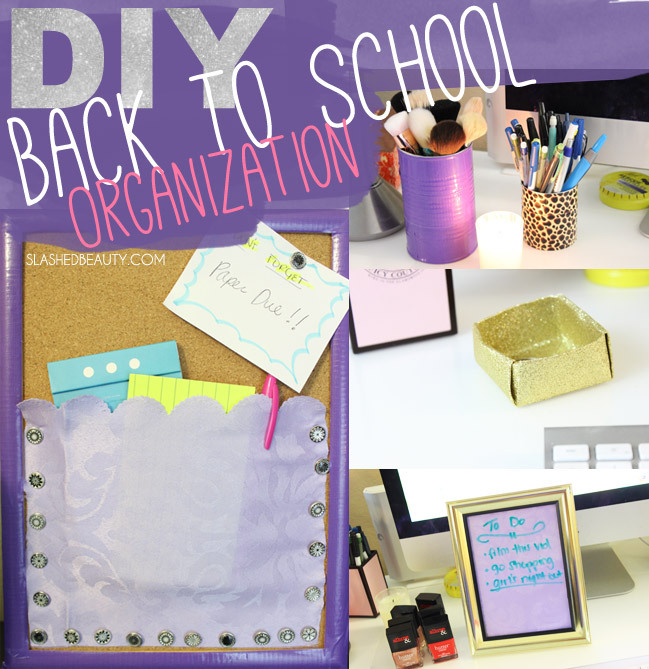 This time round, I decided to create some back to school DIY organization so I can get in the spirit of the season on the cheap. I discovered four incredibly easy projects that make handling school a little easier. Watch the video below for the tutorial on all of them! *Note, this could be a bit dangerous if you’re using cans that you opened with a can opener. Those leave sharp edges that can cut you (which happened to me). Try using the cans that have the pull off tops. These projects were all incredibly inexpensive– I got most of my supplies at the dollar store, and probably spent about $11 on everything total. If you try any of these DIYs, take a picture and tag me! What do you like most about back to school season?